Due to GE's massive transformation efforts, Illinois Tool Works and 3M may be better options for some investors. 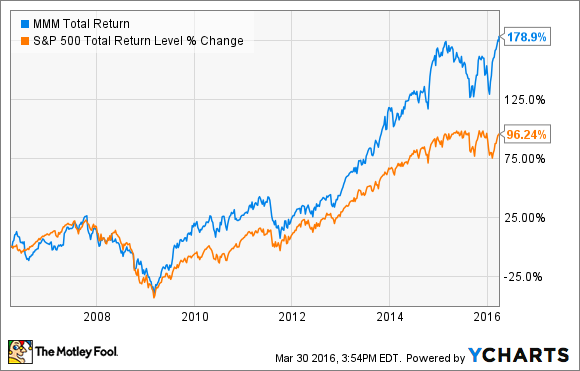 Dividend stock investing goes beyond selecting the stock with the highest yield. It requires analyzing the health and prospects of the business to find out whether the company can pay and increase its dividend. The best dividend stocks are financially healthy, can afford to increase their dividend in the future, and the underlying businesses remain on track to continue performing well in the future. On paper, General Electric (NYSE:GE) fits many of these criteria. It pays a 2.9% dividend, is financially stable, and remains committed to increasing its dividend in the future. However, the concern is that GE is currently in the midst of a massive transformation to divest the majority of its financial services business, GE Capital. Management's goal is to turn GE into a highly focused industrial company that can drive stronger earnings growth. There are a lots of moving parts to this plan, including divesting about $275 billion in financial assets, gaining regulatory approval to remove its status as a systematically important financial institution, and integrating its largest acquisition in history, Alstom. Because all of these moving parts add risk to GE stock's future, Illinois Tool Works (NYSE:ITW) and 3M (NYSE:MMM) may be better options for some dividend investors. 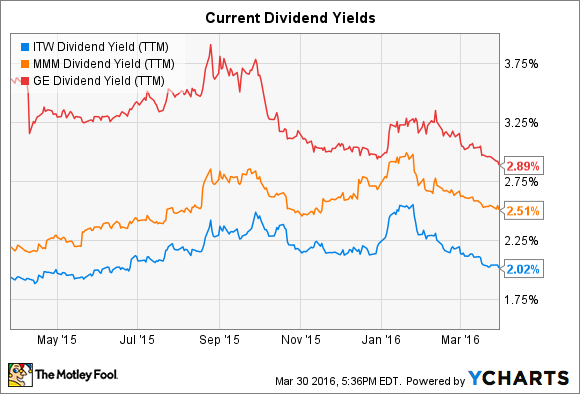 ITW Dividend Yield (TTM) data by YCharts. As a dividend payer and market beater, few dividend stocks are on the level of Illinois Tool Works. This under-the-radar $37 billion industrial conglomerate sells a wide range of specialized industrial equipment, consumables, and services to a variety of industries including automotive, food equipment, and construction. Illinois Tool Works has increased its dividend every year for the last 53 years, with the most recent being a 13.4% quarterly dividend hike to $0.55 per share in August. As the following chart illustrates, reinvesting these dividends proved to be a market-beating strategy for Illinois Tool Works shareholders over the last decade. ITW Total Return Price data by YCharts. Despite global growth headwinds and falling sales, Illinois Tool Works had a productive 2015. The company grew operating margins 150 basis points to a record 21.4%, which translated to a 10% increase in earnings per share. Behind the scenes, the earnings increase was largely driven by an 8.4% year-over-year reduction in shares outstanding. Still, these results show that management is executing well in a challenging environment. On the financial front, Illinois Tool Works appears to be in great shape to continue raising its dividend for years to come. In 2015, the company earned $1.9 billion, generated $2 billion in free cash flow and finished the year with nearly $3.1 billion in cash. During this time, it paid out $742 million in dividends and $226 million in interest expenses to service its $7.4 billion debt load. Like Illinois Tool Works, 3M has a solid reputation as a long-standing dividend payer and market beater. The Post It maker has paid a dividend without interruption for over 99 years, and consecutively increased its dividend for the last 58 years. 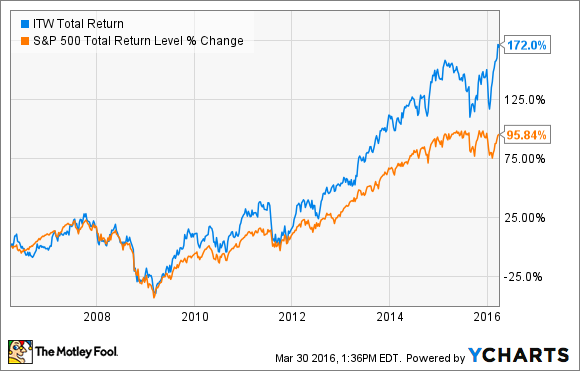 With dividends reinvested, 3M has also beaten the market handily over the last decade. Although global softness and currency headwinds drove 3M's 2015 sales 4.9% lower, the company reported a slight increase in operating margins and earnings per share. The earnings increase was driven by a 3.6% reduction in shares outstanding through buybacks. Overall, 3M earned $4.8 billion, generated nearly $5 billion in free cash flow, and finished the year with about $1.9 billion in cash. It also paid out $2.6 billion in dividends and $123 million in interest expenses to service its $10.8 billion in debt. In other words, 3M paid out half 50% of its income and free cash flow last year in dividends, which seems to be enough breathing room for it to continue funding future dividend increases. Great dividend stocks offer solid income streams and the potential to beat the market over the long term. While GE may offer a higher yield than Illinois Tool Works and 3M, the stock's nearer-term growth prospects largely hinge on the success of its massive transformation. Consequently, some investors may want to avoid buying GE as a dividend stock until after its transformation is complete. Investors of this mind-set could instead consider Illinois Tool Works and 3M, which aren't in the midst of massive restructuring efforts.